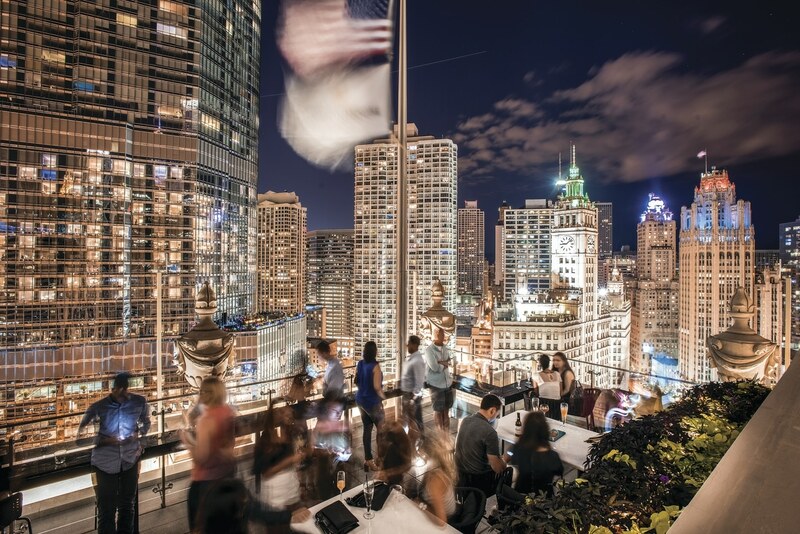 Chicago’s urban waterfront is seeing a massive revitalization, luring the city’s top restaurateurs, hoteliers and, now, travelers in pursuit of relaxed luxury. LondonHouse has a commanding perch above the river at the corner of Michigan Avenue and Wacker Drive. 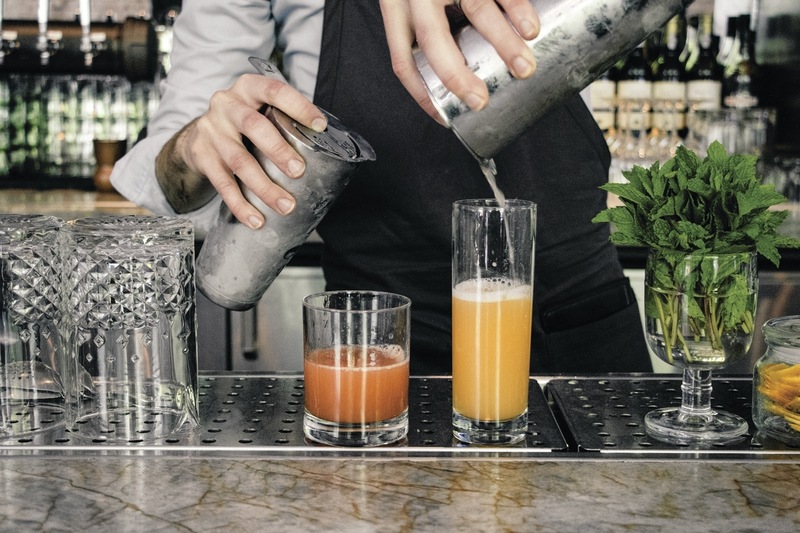 Alonso, a charismatic Clooney lookalike, has made the waterfront the site of his eighth concept, Beatnik on the River, joining other top restaurateurs who are tapping into—and accelerating—the energy around the city’s dramatically renewed riverfront. 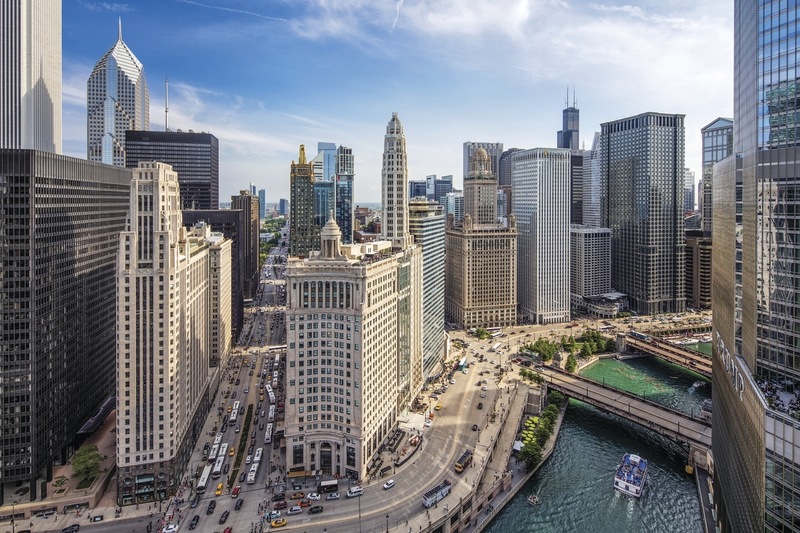 For decades, even though the waterway was the original site of the city, the Chicago River has played second fiddle to the dominant shore of Lake Michigan. Not anymore. Newly built walkways and parks allow travelers and locals alike to get closer to the water—cleaner than ever, thanks to years of improvements—and to enjoy food, drink and fun with a pleasant moving panorama in view. Few hospitality execs seem to be having more fun than David Rekhson and Lucas Stoioff, founding partners of DineAmic Group, a portfolio of eight hot spots in town. In a city filled with steakhouses, their clubby Prime & Provisions on the river’s south bank is among the most indulgent. Barrio, just north of the river, combines refinement and edginess—and delicious Mexican cuisine—in equal measure. Across the water and a block north is their newest offering, Barrio, a neo-Mexican spot. 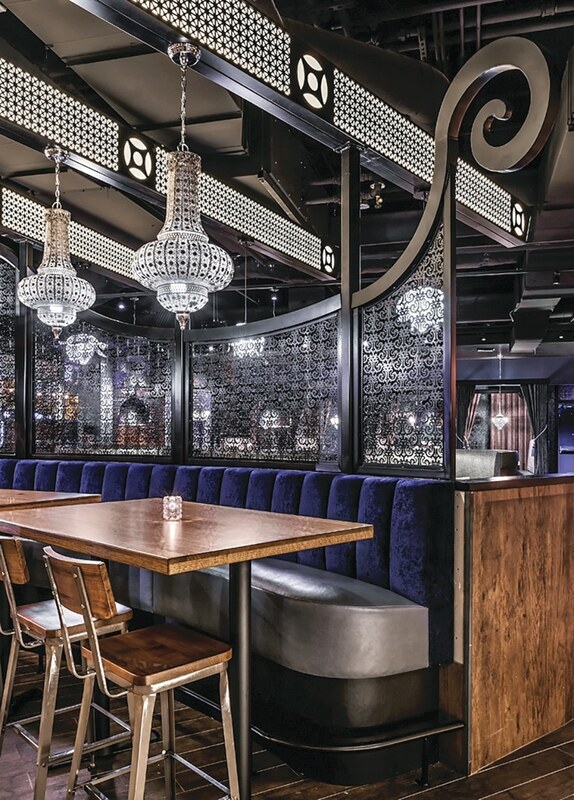 “We wanted to create a Mexican restaurant that combines the rustic and casual attitude of the culture, with a level of refinement, quality and polished edginess that appeals to the River North area,” Stoioff says. They started by snatching Top Chef alum Katsuji Tanabe from California. Well-known for his MexiKosher concept, Tanabe has brought a panoply of influences to his menu. An ahi tuna poke puts it all together: bright fresh fish, hass avocado, cucumber and serrano peppers are joined by a sambal aioli, and served with sesame brittle on the side—discernibly Mexican, yet so much more. “We want Barrio to be a place where guests don’t have to be ‘in the mood for Mexican’ in order to dine with us,” says Rekhson. Success. 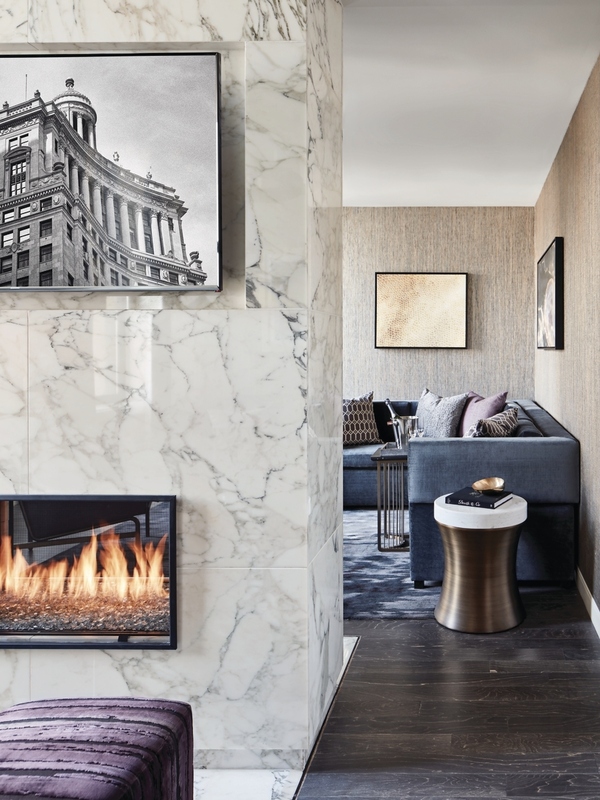 The Presidential Suite features a two-sided fireplace. For a getaway focused on the pleasures near the waterway, there can be no more ideally located lodging than the city’s LondonHouse, a property in the Curio Collection by Hilton Worldwide. A 1923 Beaux Arts edifice, the commanding structure was originally known as the London Guarantee and Accident Building. The late Paul Harvey spent a chunk of his career broadcasting from there, and for several decades after World War II, the London House jazz club was one of the top boites in the country. Much of the 1920s glamour remains in place after an award-winning major renovation. The guest rooms take design cues from luxury automobiles from the decade, with rich woods and fabrics throughout. The feel is deco—geometrically patterned walls, bold light fixtures and a subdued color palette—and even the wide bustling sidewalk outside the entryway feels like something out of an old black-and-white film. The most unique aspect of this property, however, is its stellar views of the river, Michigan Avenue and the lake beyond. Dozens of rooms on multiple floors have jaw-dropping vistas—though the 1,056-square-foot Presidential Suite (from $1,500 per night) surpasses all. From there, some of the city’s most iconic architecture seems almost within grasp. The rooftop bar, all three levels of it, takes grand advantage of the amenity as well. The stunning views from atop LondonHouse make it a draw for locals and travelers alike. Across the river, behind the shimmering terra cotta of the iconic Wrigley Building, is Beacon Tavern, the latest effort from the Gage Hospitality Group, a crowd-pleasing set of restaurants including Italian jewel box Acanto and Coda di Volpe, one of the best Neapolitan pizza places in town. Steps off the Mag Mile, Beacon feels like a bit of a hideaway, with outdoor seating on two sides (one facing the river) hidden under swaying trees and sparkling lights. Inside is the real secret, though—an understated spot with overachieving cuisine. 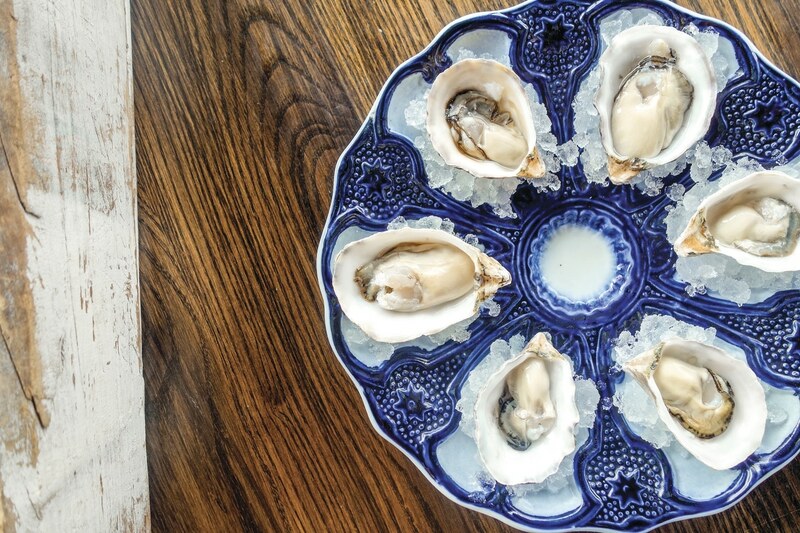 Oysters—and seafood in general—shine at Beacon Tavern just off the Mag Mile. He’s got a great chef too in Robert Broskey, whose perfectly executed fish and chips and steak frites might cause you to miss his fancier stuff. Try the duck, or any of the seafood options, where Broskey especially shines. Oysters are pristine, and the catch of the day is always a good choice. After a lunch at Beacon, head to the river itself. The best way to experience the renaissance of the waterway is, of course, to travel on it. Numerous cruise operators dock their craft on both sides of the river near Michigan Avenue, from zoomy powerboats that head out to Lake Michigan to booze cruises. A long-standing favorite has been Chicago’s First Lady fleet, six crafts of various sizes, all available for charter and some able to carry as many as 250. 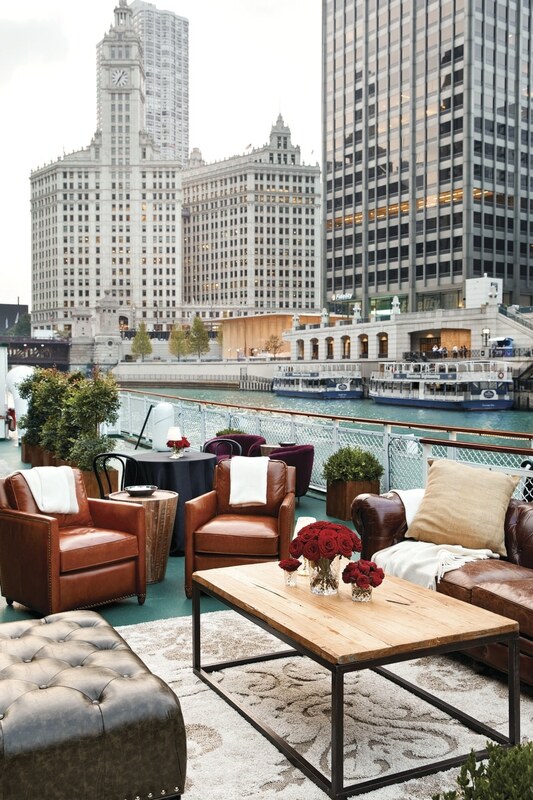 The Chicago’s First Lady fleet offers the best way to take in the river’s renewal. The company is the sole boating partner of the Chicago Architecture Center, which has an expansive new headquarters, and the architectural boat tour is a must-do. The 90-minute trip is a dazzling foray through the predominant styles of urban architecture from the late 19th century to today; one by one, you pass early deco skyscrapers, minimalist Mies masterpieces and Brutalist edifices. A highlight, on the eastern branch of the river is Chicagoan Jeanne Gang’s Aqua at Lakeshore East, a 2010 masterpiece with flowing balconies that echo its watery front door. Part of the experience of cruising the river is observing the crowds in bars and restaurants along the shore and debating: Who is having the liveliest time? Daybeds, plush cushions and fringed umbrellas make for cozy waterfront dining at Beatnik on the River. Settling the matter for now is Beatnik on the River, a seasonal offering that one local magazine described as “a bougie-boho fantasy.” That’s about right. Alonso’s original Beatnik was an instant hit. He’s cloned it here, with a few modifications, as the lower floor of a two-story establishment. There’s a street-level entrance, but the action is out back. 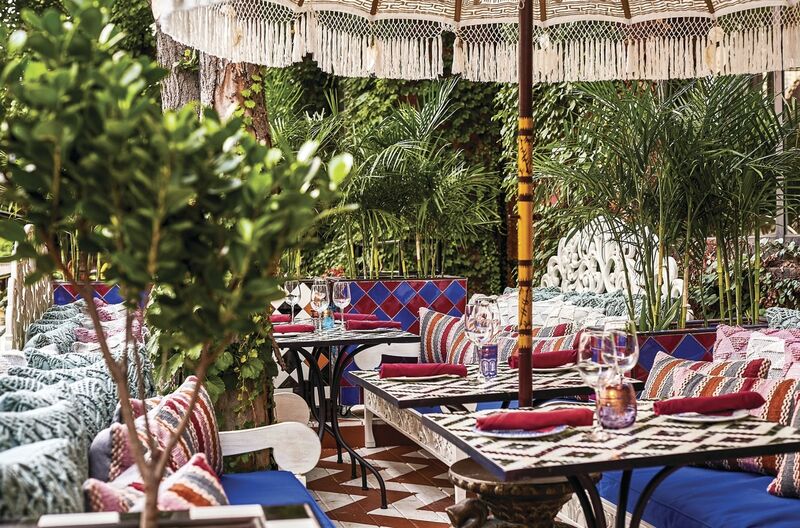 Fringe-trimmed umbrellas cover a long, skinny patio, bedecked with a variety of tropical plants and pillow-laden daybeds; the sum effect is a Moroccan oasis. The menu, with plenty of upgraded Mediterranean classics, follows suit. “Happiness, soulfulness and positive energy are contagious,” says Alonso. So is great food. The black-and-white, high-ceilinged space has a quiet energy and an expert staff. You can’t hear the river from here, but, on a trip to Chicago, it’s the perfect place to stay, or get into, the flow.